5f999ceca8b79e1616fac8d7eedc39c4 The Snyder Family: Friday Favorites: Family Game Night Edt. 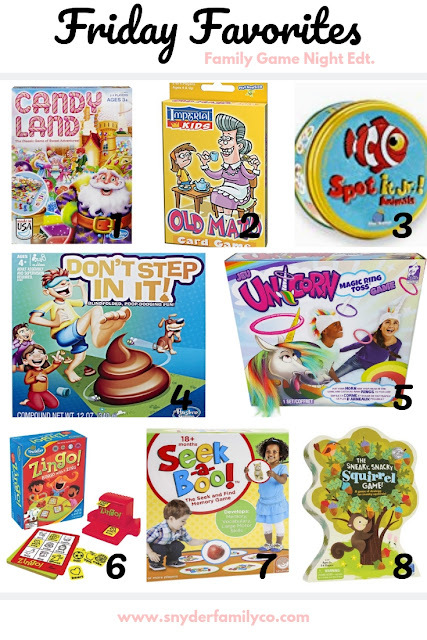 Friday Favorites: Family Game Night Edt. The post holiday germs have hit the Snyder home and let's just say Mama is tired! All three of our little ladies have been sick this week and yesterday is a day I would like to erase all together. A trip to the ER in an ambulance, three phone calls to the doctor and two visits to the doctor, I guess you could say our day was emotionally exhausting! Thank goodness for perspective when it comes to Motherhood, sitting in the emergency room, holding my sweet baby girl, I was thanking God that we would be going home and it was nothing more then a high fever. We are also forever thankful for doctors, modern medicine and of course... coffee. Yesterday was by far one of the hardest days of Motherhood yet, but I sure am thankful that tomorrow is a new day and hopefully a much less eventful one. Keep our sweet girls in your thoughts and prayers! With all this being said, we are planning on staying in our p.j. 's, playing games, watching movies and cuddling up for a weekend full or rest and relaxation! I've rounded up some of our favorite games to play as a family. 1. Candyland: THE definition of classic game if you are playing with toddlers! I have also seen so many creative ways to alter the game to what you want your toddler to be learning about, search for different ideas on Pinterest! I have made a learning our letters version that was so easy and was a great way to add variation to one of our favorite games. 2. Old Maid: I recently scooped up a version of Old Maid in the Target dollar section, it was one of my favorites growing up and the girls have been requesting to play it all the time! 3. Spot it! Jr.: My favorite game to carry around in our diaper bag, it comes in that small circular container and is perfect for long waits or wiggly friends at a restaurant table! 4. Don't Step In It: Ugh, the struggle is real with all the #poop related toys! However, Avery got this for her birthday and we were all laughing like crazy while playing. It would be a great game to play at a birthday party. I also just noticed there is a new version of this game, Don't Step In It Unicorn edition, it looks extra fun too! 5. Unicorn Magic Ring Toss: This is another game that Avery got for her birthday, I guess our friends know that we love games! It's also hilarious and we can't wait to play it with our whole family at our next birthday party. It's a unicorn/human version of ring toss, boys and girls will love playing this one. 6. Zingo: Hands down the most played game in our home! Emerson, who just turned three is getting so great at this game. It's a unique version of bingo, that moves quickly and is so much fun, our whole family loves to play. 7. Seek a Boo: I read about this on a blog years ago and it's my go-to 1st/2nd birthday gift! My girls LOVE to play this one and it could also move up to the "Get the Wiggles Out" category. As the caller, you call out a picture card and your little friends have to jump to that spot. 8. The Sneaky, Sneaky, Squirrel Game: Another game that was gifted to us that the girls love! This game encourages the players to learn their colors and has an awesome hand-eye coordination/fine motor aspect to it as well. Happy Friday friends, I hope you enjoy time with your family, I know we are going to be deep cleaning our house and praying the germs find their way out! Make sure to leave your favorite game in my comments, I would love to add a new game or two to our collection. Oh, I will pray for your sweet girls and for you all! Sickness is so rough on the family, especially on moms. My boys loved Sneaky Snacky Squirrel and a lot of the games in your round up. Thanks for sharing! Thanks Cat! It was quite the day and a pretty sleepless night, we are hoping for a less eventful day full of cuddles, happy Friday! Oh I am hoping you are all feeling so much better real quick. We ended in the ER often with my oldest who had febrile seizures and my youngest who had RSV as an infant and ended up with pneumonia complications every single winter for years until they both thankfully outgrew those problems. Here's hoping everyone is on the mend and gets a good night sleep! I was somewhat thankful that my older daughter had the same thing happen, however that minute when it's happening is so terrifying!! Just trying to keep her temp down and yes, hopefully getting a good nights sleep :) Happy Friday! Thanks so much! I have a feeling we will be playing quite a few of them this weekend, Happy Friday! Hope everyone is feeling better! My kids have been sick all week too, so it has been lots of games and movies this weekend. Thanks Jaclyn, so sorry to hear your kiddos are sick too! Hoping everyone at your house is on the mend, I think we have played every game and watched every movie we own! Our Weekend Wrap-Up: Sick Day edt. Friday Favorites: Emerson is THREE!